With Kegco's K199SS-1 Compact Single-Tap Beer Keg Dispenser, you'll have everything you need to dispense a glass of delicious draft beer straight from the keg! It features a complete Direct Draw Keg Tap System that can tap most of your favorite D System Domestic Beer Kegs, and includes a Sanke Keg Coupler, a Single-Faucet 15" Chrome-Plated Metal Draft Tower, and a 5 lb. aluminum CO2 Tank with a Double Gauge Regulator. Kegco has designed this kegerator with additional features like an attractive Stainless Steel Door, Textured Countertop with a Metal Guard Rail, a Removable Drip Tray, and a Stainless Steel Floor Mat for maximum convenience. It can also be converted to a refrigerator using the two adjustable wire shelves provided. 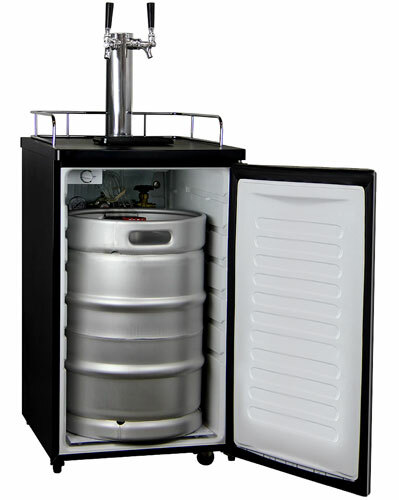 Kegco's space saving K199SS-1 Keg Beer Coolers can accommodate a Full Size, Straight Pony, or Quarter Slim Keg, or up to two Strap Handle, Sixth Slim, or Rubber Home-Brew Kegs. They will not fit the Bevel or Rubber Kegs that are commonly used by Coors and Miller Brewing Companies, as these kegs are wider in the middle than at the top or the bottom.